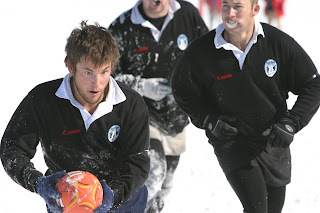 Not All Who Wander Are Lost: Rugby! Thinking about the Superbowl shenanigans earlier today (sorry, the Patriots didn't get it done, Jen), made me think of a game earlier this year. 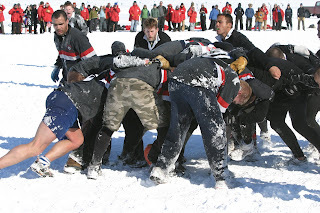 A game of great magnitude: the annual Kiwi-American Rugby match. Each year we, the Americans, put together a team and practice for a couple months. By game time, we still don't know all the rules. The Kiwis are rumored to usually put together their team the night before the match. To date, the Kiwis have not been beaten or even scored on. This year was unfortunately no different. However, it was as close of a game as we have had in years with the final score being 12-0 which should be two tries and a kick to our none. The Kiwis only scored in the first quarter. After that, the American team knuckled down and played three quarters of great defense. They didn't give up another point and came inches from scoring their own try. If it wasn't a Kiwi referee, we might have gotten that one too. After the match, I heard about two loose front teeth and a broke rib. 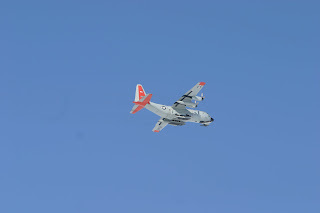 A fly by from the pilot of a C-130 Hercules. This year, the game was delayed by a week. 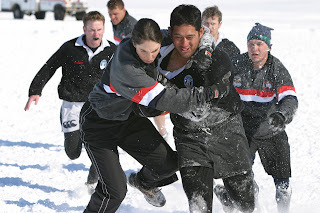 During that week, a division of the Kiwi military called the New Zealand Defense Force came to town. 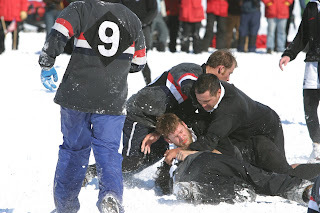 They were living at the American base, McMurdo, but played for the Kiwi side. They were big and just may have made the difference as to who won the game. No word yet if the game was delayed on purpose to let them get down here. Inquiring minds want to know. Emily Wampler tries to throw the laughing Kiwi ball carrier to the ground. I think she did it. 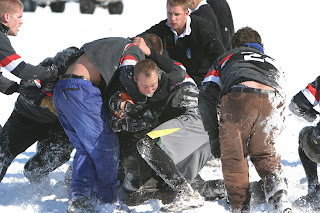 I'm not sure if they have been certified yet, but for years the organizer of the American squad, Keith Depew, has been trying to get certified by the Guinness Book of World Records for the Southernmost Rugby game in the world. (Can anyone explain to me why a beer company has a World Records book?) Guinness has a few hoops to jump though, but I think they have finally met their standards. Now, they just need the official certification. Certified or not, I'm pretty confident there aren't any other games South of here. Without a doubt, most Americans don't understand this game. We just didn't grow up with it. We all came out to watch and cheer, but that doesn't mean we understood. A ton of the people went home thinking that the Americans had scored a try only to learn later that it was overruled. I imagine it is the same experience when people watch American football. I've watched rugby a few times and this was one of the first times I finally understood it and that was only because I was having the Kiwi sideline explain what was going on. Hopefully, some of it will stick this time. A Kiwi ball carrier runs for this life . . . or maybe to score.